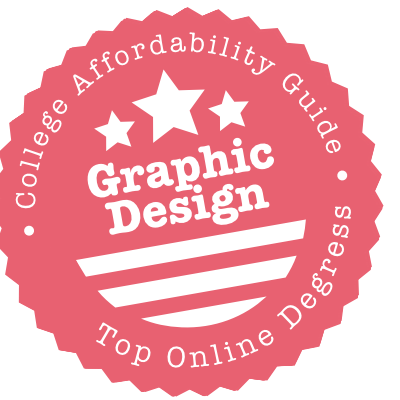 Scroll down to see the top not-for-profit colleges offering graphic design degrees online. Students interested in graphic design can earn a Bachelor of Arts in Graphic Design through an online program offered by Bellevue University. The college also has an online minor program that allows students to minor in either print or web graphic design. Students in the graphic design program use the same graphic design hardware and software that professionals in the industry use, so they gain hands-on experience along with theory. As part of their coursework, students develop a professional portfolio they can show to potential employers. Students take 42 credits in the major and complete 127 credits overall. Big Sandy Community and Technical College has five certificate programs and a diploma in visual communication that students can earn entirely online. Certificate options include digital photography, digital imaging, and web design. The college also has an online program leading to a diploma in digital production artist. To earn the diploma, student complete between 48 and 51 credits, including more than 40 credits in visual communication classes. Diploma students also complete an internship or practicum to gain real-world experience. The number of courses and credits required for the certificates varies by program. The Community College of Vermont has an Associate of Arts in Graphic Design that can be completed entirely online. The program is intended for students who want to begin a career in commercial art or who want to transfer to a four-year college to earn a bachelor's degree in graphic design. To earn the degree, students must complete at least 60 credits, including required general studies credits that will transfer to a college or university. Graphic art students learn to use industry-standard software and take classes covering topics such as graphic design, drawing, typography, web design, and digital photography. As a capstone project, students will work on a real-world project and also develop a professional portfolio. Foothills Community College offers an online program for students who want to earn an Associate of Arts in Graphic and Interactive Design. Students in the program must complete 90 units, including 54 units in the major. Required courses for the major include fundamentals of drawing, 2D design, several graphic art studio classes, website design, typography, and photography. Classes within the major are typically offered online at least once every two years. Students must also meet general education requirements. Foothills Community College also offers online programs leading to a certificate of achievement in Graphic & Interactive Design and a career certificate in Web Design and Development. Gateway Technical College has an Associate in Applied Science in Graphic Communication that students can complete entirely online. This is a 60-credit program that full-time students can complete in four semesters. The curriculum focuses on hands-on learning, and students will create designs they can display in their portfolio when job hunting. For additional experiential learning, students can complete an individual internship or take part in a team-based project called BizSquad, where students from different business disciplines join together to complete a project for a local business. Students seeking a global perspective can study abroad through Gateway's International Education program. Graphic design students also complete in a district-wide design show each year. Lindsey Wilson College has undergraduate and graduate options for student who want to earn an online degree in interactive media design. The Bachelor of Arts in User Experience Design is an interdisciplinary program that combines classes in art and computer graphics with 16 credits in interactive design studio work, including a capstone project. Students choose an area to focus on for projects that will be used in the final portfolio. The Master of Arts in Interactive Design requires students to complete 30 to 34 credits. Required courses cover topics such as user experience prototyping, information and interface designs, and dynamic programming for interactivity. Students can complete the program in about four semesters. Students in the digital arts program offered by Southern New Hampshire University can earn a general Bachelor of Arts in Graphic Design and Media Arts or they can select a concentration in web design or in 3D modeling and animation. Required courses cover topics such as design and color theory, graphics in print media, digital imaging, typography, and graphic design for the web. Students in the 3D modeling program also learn to use industry-standard software for modeling and animation, and web design students take four courses specifically on web design. To earn the B.A. from SNHU, students must complete 180 credits, including general studies requirements. The Parsons School of Design at The New School in New York City has a Graphic and Digital Design Certificate students can complete online or through a combination of online and on-campus coursework. This is a continuing education program that is open to both beginning and advanced students. Much of the coursework focuses on technical training, such as courses in PhotoShop, InDesign, and Illustrator. Parsons also has an Open Campus Pathway to Graphic Design program in partnership with CreativeLive, an online educational platform for individuals in creative fields. This is an 11-course, introductory program curated by YuJune Park, a Parsons professor. Earning your graphic design degree online seems like a win-win situation. You’re honing your technical skills (e.g. multimedia and web design) at the same time as you’re getting comfy with online communication. For someone intending to run their own graphic design company, this sounds like a dream come true. But before you sign on the dotted line, read the fine print. Graphic design classes often require a lot of expensive software and computer power. You won’t be able to use the university’s labs, so who pays for these resources? You or the school? Remember, too, that you will be judged on your work samples. Your key goal is to build a stunning portfolio, so make sure you have plenty of hands-on support (even if it’s virtual).